UPDATED: Sat., Feb. 2, 2019, 9:11 p.m.
An explosive point guard to point guard alley-oop was a springboard for the offense. With 13:51 left in the second half, Josh Perkins nabbed a San Diego pass and found Geno Crandall streaking beside him for the slam. 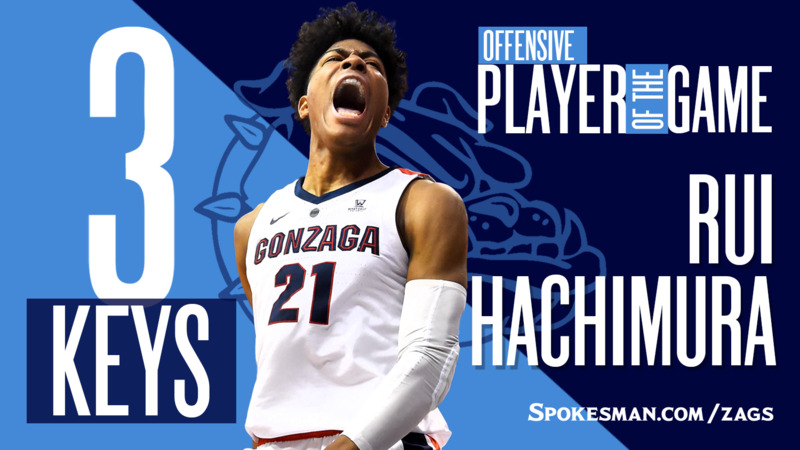 While the rest of the Gonzaga offense was spinning its wheels, Rui Hachimura put the team on his back for most of the first half, accounting for 20 of the Zags’ 38 points. He consistently pounded the ball inside and finished with 32 points. It has to be the guy who is one block away from tying the single-season record. Brandon Clarke added two more swats to his record-breaking pace to sit at 69 for the season – tied with Zach Collins. Austin Daye produced 70 in the 2008-09 season. Clarke also grabbed a team-high eight rebounds. Published: Feb. 2, 2019, 7:22 p.m. Updated: Feb. 2, 2019, 9:11 p.m.